On April 1, 2015, the Commission brought its first case involving restrictive language contained in a public company’s confidentiality agreement. According to the SEC, the confidentiality agreement had the effect of discouraging SEC whistleblowers from reporting to the Commission. 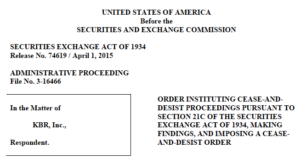 The Commission’s Cease-and-Desist Order did not even discuss whether the company committed any other violations of federal securities laws. 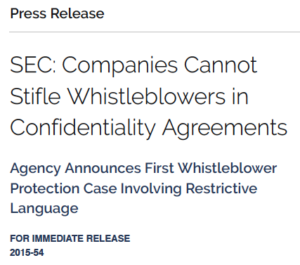 The Order focused entirely on the language in the company’s confidentiality agreement that had the potential of discouraging SEC whistleblowers from reporting to the Commission. The company involved was KBR, Inc. (“KBR”). According to the Order, KBR typically interviewed employees as part of internal investigations that it conducted. Although not required, KBR’s internal investigators had employee witnesses sign a confidentiality statement at the start of their interviews. The confidentiality statement was also included in KBR’s Code of Business Conduct Investigation Procedures Manual. KBR’s confidentiality agreement required employee witnesses to agree that they were prohibited from discussing their interviews “without the prior authorization of the Law Department”. A breach of that agreement could lead to disciplinary action, possibly including termination of the witness’s employment with KBR. According to the Order, the language in KBR’s confidentiality agreements undermined the purpose of the SEC’s Rule “by prohibiting employees from discussing the substance of their interview without clearance from KBR’s law department under penalty of disciplinary action including termination of employment”. the Commission is unaware of any instances in which (i) a KBR employee was in fact prevented from communicating directly with Commission Staff about potential securities law violations, or (ii) KBR took action to enforce the form confidentiality agreement or otherwise prevent such communications. Nevertheless, in a press release, the Director of the SEC’s Division of Enforcement explained that “By requiring its employees and former employees to sign confidentiality agreements imposing pre-notification requirements before contacting the SEC, KBR potentially discouraged employees from reporting securities violations to us”. Among other things, the SEC imposed a $130,000 civil monetary penalty on KBR. Nothing in this Confidentiality Statement prohibits me from reporting possible violations of federal law or regulation to any governmental agency or entity, including but not limited to … the Securities and Exchange Commission … or making other disclosures that are protected under the whistleblower provisions of federal law or regulation. I do not need the prior authorization of the Law Department to make any such reports or disclosures and I am not required to notify the company that I have made such reports or disclosures. The Order also required KBR to agree to make reasonable efforts to contact employees who had signed the confidentiality statement, give them a copy of the SEC’s Order, and provide them with “a statement that KBR does not require the employee to seek permission” before communicating with the SEC or any other governmental agency or entity.